If there were two sound bytes that could perfectly encapsulate fan sentiments from the 2017 Tech football season, they would be “The triple option is the worst” and “Fire Ted Roof.” Ever since Miami lit up the Jackets for 45 in Roof’s fifth week as defensive coordinator back in 2013, Tech has struggled to find a way to limit opposing offenses. However, while one does not have to have an A in MATH 3215 to realize that allowing a career 25.1 points per game is far from a sustainable pace, identifying the causes of Tech’s struggles is in fact easier said than done. In a previous article, the Technique reported that under Roof’s leadership, the Jackets ranked in the bottom of the ACC for tackles, sacks and preventing YPA against the run. This time, the goal is to break down the past defensive scheme and highlight the ways in which incoming DC Nate Woody hopes to improve upon them. While defenses at the professional level have been slowly abandoning a “base” format in favor of the flexibility offered by having personnel for various looks, collegiate defenses are far less likely to rotate out the front seven as frequently. The reliance on starters and tendency to keep a consistent core throughout games makes it easier to operate out of the same formation on a weekly basis, using stunt packages to keep the offense on their toes. Roof implemented a 4-2-5 scheme that is a modified variation of the prototypical 4-3 defensive alignment. In the 4-3, there are four down linemen (two ends, a tackle and a nose tackle) and three linebackers (a weak-side “Will,” strong-side “Sam” and middle “Mike”) that act as the “front seven;” they are generally used as the key playmakers against the run and for pressuring the quarterback. This formation relies on quicker linemen to penetrate and maintain the majority of the pressure in the backfield. The tackles penetrate and get downfield while the two ends set the edge and contain runs to the outside while bearing in on the primary ball carrier. Because there is one extra lineman in this formation as opposed to the 3-4, which only has a front three, there is more room for creativity in the points of attack which can catch offensive lines off guard and allow for one of the linemen to make a play behind the line of scrimmage. Tech’s front four did an admirable job this year in terms of making key third down stops in short yardage situations. In fact, Roof’s decision to convert one of the 4-3 linebackers into a more protective 4-2-5 prevented plenty of deep plays downfield; with two cornerbacks, a strong and free safety and an extra permanent “nickel” back, there was rarely a point in the field more than 15 yards out that was vulnerable to a deep attack thanks to a swarming double coverage that occupied key read areas. The problem with adding a member of the secondary is that it takes away from the linebackers. In a 4-3 defense, the “Mike” linebacker acts as the de facto quarterback of the defense, as his primary responsibility is to read the opposing formation and make an instinctive call as to where the coverage should be concentrated — generally acting as the man in charge of corralling runs up the middle. In addition to this, linebackers in a four-man front have to be explosive and agile, able to converge on the run or drop into man pass coverage on any given play. By taking the position group responsible for adapting to the opponent and limiting their personnel size, Roof created a difficult situation. 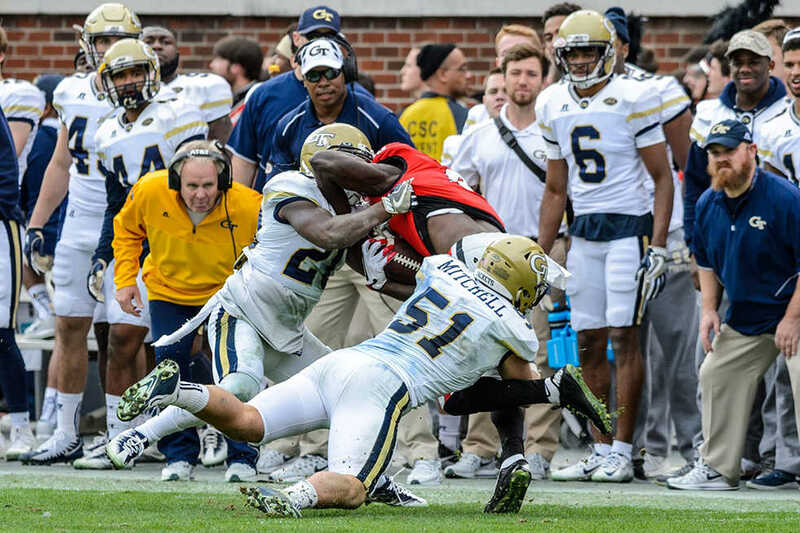 Outside of the Georgia game, Tech was never really done in on one big play here or there. The extremely conservative Jackets limited the opponent’s big plays while failing to create many takeaways of their own thanks to a hyper-protective scheme that did not properly give the team’s many playmakers the opportunity to make big time plays. Theoretically speaking, the perfect 4-2-5 defense would lock down opposing receivers with an amoebic man-zone hybrid in the secondary and create enough pressure with the front four to force quick pitches and other outside plays for minimal gain, taking the pressure off the linebackers. Unfortunately, the harsh reality of Jackets football is that the team lacked a solid interior defense to prevent the run adequately with only two backers, and since Roof refused to ever let his corners play a proper press coverage, the Will and Sam were pulled in too many directions at the same time between slot receivers, pass-catching running backs and any no-name who felt like jamming the ball up the middle for a few yards a play. Fortunately, with fresh blood comes fresh ideas, and Nate Woody has already made it crystal clear to the media that he will be bringing his aggressive 3-4 style to the ACC with him this fall. By moving both a lineman and secondary (most likely the nickel or free safety) to the linebackers consolidating the meat of the defense five yards back, the defensive identity for both position groups in the front seven has been completely configured to better hide Tech’s weaknesses and allow for more versatility. With only three men acting as down linemen now against five on the offense, the ends and nose tackle will now be focused on winning the numbers game, trying to occupy as many opposing linemen possible with their three bodies. This shifts the focus from athleticism to sheer power and size, as there will be less of a need for the front three to make plays behind the line of scrimmage. Instead, the linebackers will be re-divided into the interior (Will and Mike) and exterior (Sam and LEO) designations, the former typically remaining in coverage or spy positions with the latter used as the main pass rushers and disruptors off the ball. Generally speaking, the use of a 3-4 scheme simplifies the roles for a defense. Linemen control the trenches and plug up gaps against the run, forcing the ball into the clutches of the blitzing backers or stalling long enough for the penetration to generate a sack. Reducing the secondary from five to four will most likely mean that there will be less man coverage and more zone as the safety help can no longer be relied on as heavily if a corner is torched close, but Roof rarely ever took advantage of his ability to lock down the flats when he schemed for it in the first place, so the opportunity cost is certainly minimal. All in all, the 4-3, 4-2-5 and 3-4 all have their individual merits and cannot be referred to as “superior” without taking personnel into context, but judging from the results generated over the past five years, there is really nothing to be lost by taking a more aggressive approach and attacking the enemy instead of letting them come to us. Expect more sacks and tackles (good), more passing from the opponent (bad) and exactly the same amount of QB keeps for a gain of 3 on third and 4 (ugly).